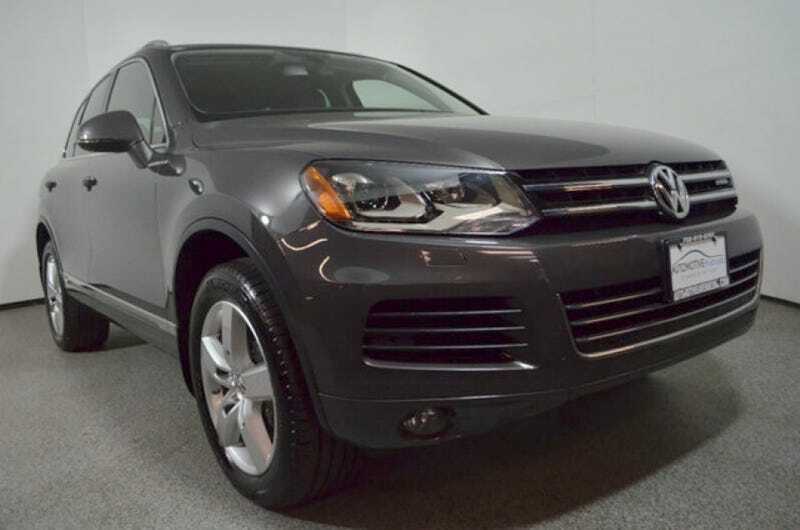 For $17,995, Would You Make Happy Memories In This 2011 VW Touareg Hybrid? For today’s Nice Price or Crack Pipe contestant we have a car that—to be perfectly honest with you—I had forgotten even existed. Let’s see if this Touareg hybrid’s price makes it worth remembering once again. So, I received a very complementary email from the seller of last Friday’s 2004 Maserati Coupe GT. As you will recall, that car looked to be in amazingly nice shape despite its having major mileage. The now former owner wanted me to know that he appreciated having the car featured, and that he had sold it that day for close to its $12,900 asking. That of course went against your recommendation, as the vote on that price went down in a 62-percent Crack Pipe loss. Somebody came out ahead in that deal, we’ll probably just never know who that was. Hey, when I say “hybrid” what comes to mind? Is it the Toyota Prius, driven by some hemp-wearing, antiperspirant shunner who “wants to save the Earth.” Pffft. These are the kind of people who, went confronted by a spider in their home, carefully capture it in a biodegradable paper cup, gently carry it outdoors, and then offer a Charkra chant for its wellbeing as it scuttles away. Yep, those are your stereotypical Prius hybrid owners. Another image of hybrids and their owners is of the Prius’ fancy-pants cousins, the Lexus hybrids. Those are driven by those of more means and who aren’t really interested in saving the plant, but want people to think they are. If you live in a gated community, this is your likely image. In either case, what you probably don’t envision is a freaking Volkswagen Touareg. Hell, show of hands: who here even knew that VW built a gas/electric edition of their uber-expensive all wheel drive wagon? I know, right? This 2011 VW Touareg Hybrid is a true unicorn. It features a 3.0-litre supercharged DOHC V6 up front, and an eight-speed automatic parceling power out to all four wheels by way of Volkswagen’s 4Motion no-fuss/no muss drivetrain. What makes it a hybrid is the electric motor in between the pressurized six and those eagerly waiting eight speeds. To feed its want for watt there’s a tiny 1.7 kWh nickel metal hydride battery pack. You can go up to almost 35 mph for about one mile on electric power alone on that, and the car comes with all the fancy bells and whistles to keep it doing its thing: regen braking, stop-start, lots of orange cables, etc. All that manages to imbue the Touareg Hybrid with some pretty impressive performance numbers. The gas/electric drivetrain is good for a combined 380 bhp and a massive 428 pound-feet of torque. That gives the big VW a zero to sixty time of under six second, a towing capability of 7,700 pounds, and a combined EPA fuel economy rating of 21 MPG. Add to that all the luxury accouterments VW could throw at this thing and it’s no wonder it cost over $65K when new. This one-owner car is now six years and some change out from being new, but it still presents pretty well with its Galapagos Grey metallic paint and Anthracite interior. Up top you get a panoramic moonroof, while down where the work gets done there are clean 19-inch “Everest” wheels. The dealer-offered car comes with both a clean title and Carfax, and with a mere 79K on the clock. The interior appears almost “as-new” and even comes with a VW load liner under the hatch. There’s power everything in here so you can feel like one of those gated community fat cats, but you still won’t have to empty ANWR to feed it. Okay, so now that I’ve jogged your memory and you’re all out of breathe as a result, let’s consider what this extremely rare (about 240 sold in the U.S. in 2011) Touareg Hybrid just might be worth. That’s kind of a toss up as while the Touareg in general has a history of high prices, it’s also known for having lots of electrical gremlins as well. That latter issue helps in conspiring to saddle the model with precipitous depreciation. Case in point, this car when new started at over $65K. Here now, just a little over six years later and with about 13K per-year in mileage, it’s asking just $17,995. No, that’s not chump change. You could go on a hell of a weekend bender in Las Vegas for that, or, if you’re in the middle class, pay off your newly assessed taxes next year. What do you think, is buying this Touareg Hybrid a better use of that $17,995? Or, does that price consign this forgotten VW back to oblivion? eBay out of Wall, NJ, or go here if the ad disappears. For $7,477, Could This 2004 VW Touareg V10 TDI Make You The Torque Of The Town?